Now you can print high-end photography, posters, and retail graphics for either custom or high volume projects with your HP Latex printer on this versatile resin-coated photo paper. There’s no need to wait; print and deliver to provide quick turnarounds for your customers. 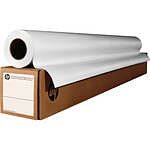 This heavyweight photo paper (275 g/m2) also provides increased stability for handling high-volume production. The bright-white finish provides a high dynamic range and a wide color gamut for color-critical, eye-catching reproductions on a satin finish.